A playful scout troop on the Little Manatee. 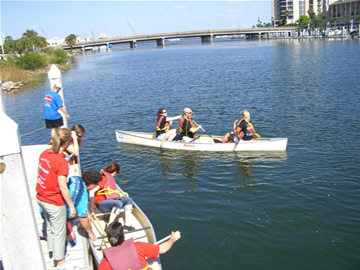 A corporate "Amazing Race" event in Tampa. Friends gather after a relaxing paddle trip. One of the reasons our family owns the Canoe Outpost is that it lets us work with people who are playing and having fun. Group paddling trips are fun for all including our family and staff. At the Canoe Outpost, any group renting at least 8 boats or more in any combination of canoes or kayaks with a 7 day advanced reservation qualifies for our special group rates. We will also assign a group trip coordinator to your group to be sure that all your needs and expectations are met. 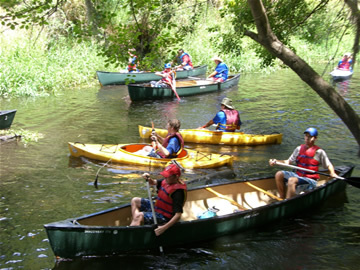 We have organized or provided services for many types of group outings and events including scout troops, family reunions, church groups, corporate events, birthday parties, neighborhood associations and paddle clubs from 6 to 96 people. A group can be as simple as 6 friends kayaking or it can be 50 people in 25 canoes needing a catered picnic, a family group camping with us and doing a day paddle or boats delivered to your family or corporate event. What ever form your group takes and what ever your needs, we look forward to working with you to provide a great group outing. Group members arrive at the Canoe Outpost usually between 9:00 and 11:00 AM. We go through the check in and payment process which can be done individually or with one payment from a group leader. Optional items such as seat backs and dry bags may be rented for the whole group or individually as desired. There are restrooms, showers and changing rooms available and a basketball hoop for your use while waiting for all group members to arrive. Coffee and pastry may be arranged for if you like. We can provide facilities for pre-trip picnics, fellowship or other pre-trip meetings if needed. Once checked in, we will give everyone a map and explain the river trip they will be taking. We then launch you off in your boats. Most groups plan to paddle about 75 minutes down to the riverside picnic pavilions in the State Park. There you have pavilions with tables and a large group BBQ grill, nearby restrooms, nature trail, and playground available for your use. These pavilions are first come first served or they may be reserved through the State Park for a fee. These pavilions are also accessible by land and can provide access for catering or for group members who may not be involved in the on water portion of the outing. After the pavilions, you will paddle the remaining 60 minutes down to our pick up point where we will meet you with buses for your return trip to the Canoe Outpost. Some groups allow extra time for tree rope swings along the way. Some or all of your group may wish to extend the paddle trip by paddling the Big or Small Manatee Loop sections. This can add up to 90 minutes of paddle time to your trip but you will return to the same pick up point. Once back at the Canoe Outpost, post-trip picnic and meeting and facilities can be arranged for your use. Please call us today and let us help you plan your next outing.